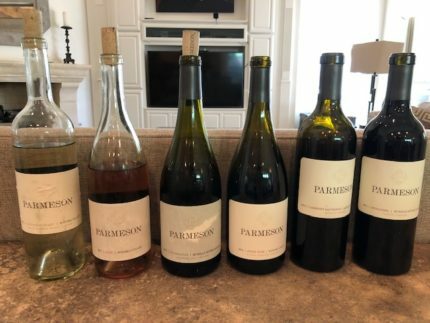 Tom Parmeson, Owner and Winemaker of Parmeson Wines, never aspired to be a Sonoma winemaker. He successfully worked for 15 years in software development for Halliburton Company, an oil and gas exploration service company based in Houston. But in 2005, he had an epiphany after visiting a tasting room and walked out into the vineyard. As he looked around, he realized he wanted to shift his life and legacy and “go live” in Sonoma. At that point, he was a home beer brewer. That vineyard moment started his hard-working quest to become a winemaker. He went home to Houston, started arduous research and began taking classes. Because he still held his job, he used all of his vacation days to work California harvests – four of them – until he decided the fifth harvest was the charm. That is when he moved his wife, Katie, who he credits with introducing him to fine wine, and his three children to Healdsburg. 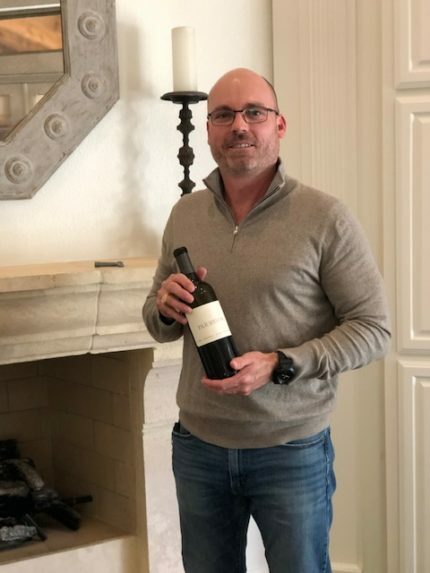 Today, he uses the facilities at Mauritson Wine, where Clay Mauritson and Emma Kudritzki Hall serve as consulting winemakers. He credits Bill and Betsy Nachbaur at ACORN winery as key to his learning and where he worked his first harvests. Tom has completed his Winemaking Certificate from UC Davis and has taken viticulture and enology courses at Washington State and Grayson College in Texas. Tom’s philosophy is to source fruit from Sonoma’s top growers and winemakers. And for a guy who moved here from Houston without connections, the list is impressive — Lee Martinelli Jr; Steve MacRostie; Bill Nachbaur; Bret Munselle and John Macleod. The fact that these winemakers and growers are good stewards of the land is important. 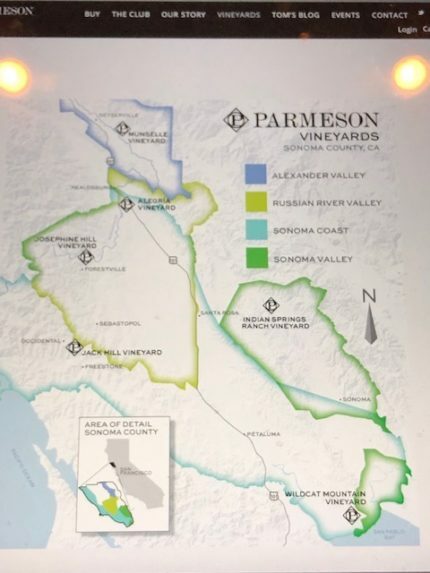 It’s about the reputation of the site, the reputation of the grower and involvement in the growing process – down to the specific rows used in Parmeson’s single vineyard wines. Tom told me his winemaking philosophy focuses on the basics. Producing handcrafted wines in small lots with attention to detail. Having a handful of trusted and exceptional growers who are dedicated to their land. And, most importantly, making wines that customers are proud to serve to their friends. 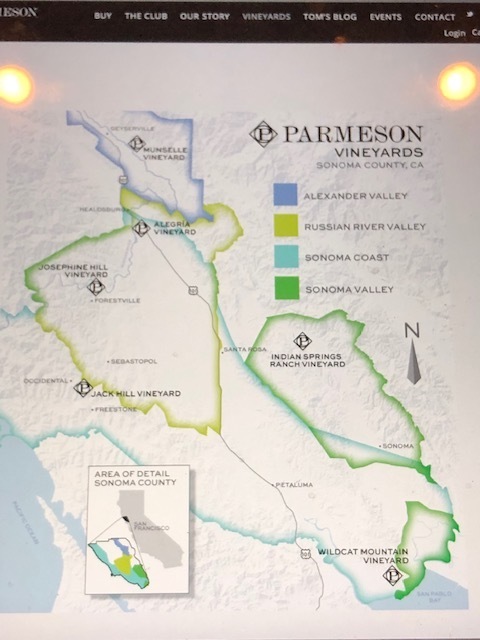 2018 Parmeson Sauvignon Blanc – green apple, bright citrus, melon, herbal notes and a balanced minerality that kept you wanting another sip. And, I loved that he initially made this wine because his wife wanted a Sauvignon Blanc in their portfolio. 2017 Parmeson Rosé – this Provencal-style, dry rosé had notes of juicy strawberry, watermelon, citrus, apple and a nice dryness. It would be a good rosé to match with food as it had enough structure and balance to stand up nicely. 2015 Parmeson Chardonnay – this was an Old-World style of Chardonnay with notes of lemon tart, stone fruit and almond tart. 2016 Parmeson Pinot Noir – notes of cherry pie, earth, leather, spice, cedar, cassis and herbs. Very aromatic and delicious. 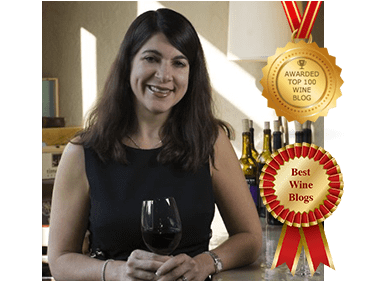 2015 Parmeson Cabernet Sauvignon – This wine was made in a Bordeaux style. I tasted notes of blackberry, black cherry, cocoa, chocolate, eucalyptus, spice, vanilla and herbal notes. It’s elegant and most importantly, drinkable today, but easily ageable. 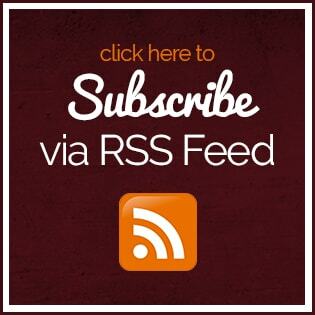 2015 Parmeson Zinfandel – this wine screamed to be paired with a Thanksgiving dinner. But it was a refined Zinfandel that didn’t require food and easily could be enjoyed alone. I tasted cranberry, cherry preserves, pepper, spice, earthiness and herbal notes. The story of Parmeson Wines is a story of a man who had the guts to follow his dream and based on the wines that I tasted, will do great things in Sonoma as he executes that vision.